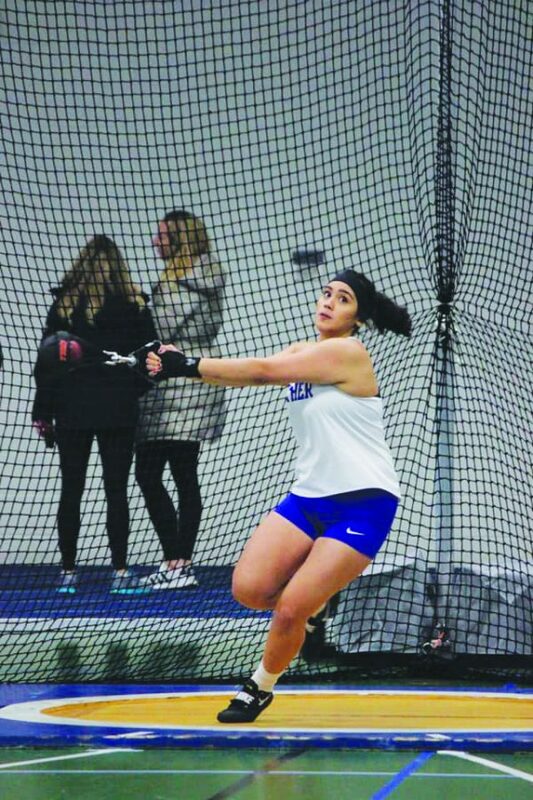 Mariah Balajadia (‘21) throws hammer at the Indoor Alumni meet on February 1. 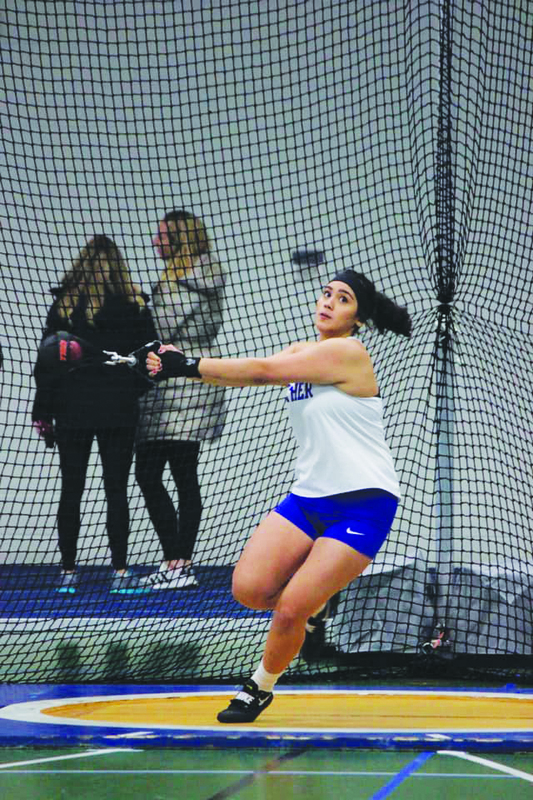 Anneliese Barton (‘21) throws discus, shot put, hammer, and javelin on the Luther Women’s Track and Field Team. 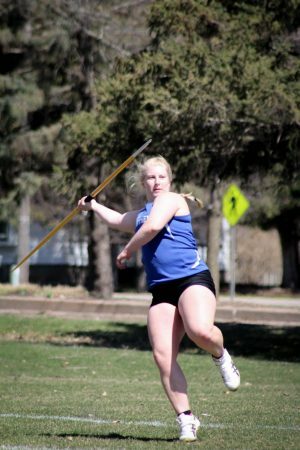 She ranks seventh in Luther’s all-time outdoor javelin list. Mariah Balajadia (‘21) also throws discus, shot put, hammer, and javelin. She currently ranks fifth on Luther’s all-time outdoor hammer list. When and why did you start track and field? Anneliese Barton: I started track [and field] in middle school, and high school I ran a few 100 [meter races], but I was much more dominant in throwing, so I just stuck with that. And I was a pitcher in high school, so I had a little bit of background. I originally did it just to stay in shape for softball and then throughout high school I really just developed a love for it and in college, it’s grown even more. Mariah Balajadia: I did track all throughout middle school and for two years in high school. I did running events as well as throwing, [but] I predominantly did track just to stay in shape for other sports [volleyball and basketball]. I took a break [from track] in high school, and I came back to it and I started to pick up throwing and it kind of went off from there. [I] ended up finding out that I was okay at it and I got a couple records, so I stuck with it and at Luther. I was going to do volleyball or basketball here, and I ended up not taking up that opportunity. I kind of fell off the wagon with who I was as a person and what to do with [my] extra time. Then Jeff Wettach invited me to be on the team, and it just went off from there. Which events are your specialties? AB: I think javelin for sure is now more of a specialty — javelin and hammer. MB: Hammer is definitely the one I emphasize in. Bottom: Anneliese Barton (‘20) throws the javelin at a meet at St. Mary’s University on April 28, 2018. You just opened up your outdoor season at the Cornell College Invitational on Saturday, April 6 with some notable personal bests. Can you reflect on how that meet went? AB: We started with javelin that day, and I was just doing five step [approach]. We only really had two practices before, so I wasn’t really expecting anything big. We really couldn’t get any work in before spring break. I also didn’t practice javelin that much last year, it was just harder, and I didn’t make it a priority. So I wasn’t expecting to do well at all. And I had a four meter [personal record] off of a five step [approach]. Normally people do like a run up, and then a seven step [approach] and everyone else was doing that. I just threw 37 [meters] and won the meet, by just doing a simple five step, so that was kind of not expected. I threw that in the preliminary [round] and then in the finals. MB: I was actually really nervous to compete that day. I was reflecting on how last year went, where I was at and where I would be, and I suffered with a lot of performance anxiety last year, so that really capped my potential. I went into this meet just focusing on myself and trying not to compare myself to the other throwers. This past week I was going through a lot of self-reflection and how I can be more aware of myself and not other people. And so deleting a lot of my social media really helped clear my mind, and stepped into the ring and threw my first throw [in hammer] which was a 35 [meter] which was right on track with where I was at last year, and then my second throw was out of nowhere with a 40 [meter]. That was a huge thing for me because it really just broke the limitations that I had for myself and just kind of showed how the rest of the season would turn out for me. It felt really good to see what I could do. Moving forward with the outdoor season, what are some personal goals? AB: For javelin, I definitely would like to throw 40 meters. I had a goal of throwing 36 meters this season, but when you throw 37 [meters] your first meet you [have to] change that. And yeah, my goal is 40 meters and to hopefully place top three [at the American Rivers Conference Outdoor Championships]. For hammer, [my goal is] probably 38 meters. MB: Just to focus on my own growth and really trusting the process. Just seeing the potential that I have now I just am really excited to see where the rest of the season comes and I kind of have to trust what I’m doing and understand that there’s [going to] be bad meets and bad days and the good ones are always [going to] happen eventually, so kind of just enjoying the process, really. As throwers in the track and field team, are you all a close group? AB: We’re really close. When any of us are having a bad day we can all just talk about it when we’re all just being silly. We can always be goofy with each other. We’re just all together being nuts, but being productive. MB: When something goes wrong, we’re all there to support each other. But when things go right, you’re bound to have a good time. The throwers group is just a weird group all together, just weird people, in a weird group, doing weird things. So the dynamic is just awesome. I keep showing up for some reason. Where is your favorite place you have competed as a part of the Luther track and field team? AB: [The A-R-C Outdoor Championships] last year [at Central College, in Pella, Iowa]. Everything was really close together, so we could see a lot of the [rest] of the meet. Other people could easily come and watch us and we could go easily watch everyone. [It’s]especially [nice] at Conference when you’d really like everyone’s support. MB: [The A-R-C Indoor Championships] this year at Wartburg, just because the competition is high and the rivalry of Luther and Wartburg it kind of produces that energy to want to do well. And the disrespect is very real. Who is an athlete that you look up to? AB: I kind of look up to Ronda Rousey. She’s just really strong and embraces it. She just does the freaky, like, she doesn’t care. MB: One person that comes to mind is Aubrey Highum (‘20). She’s on the track team, she’s just really motivating and she has a good attitude. And just overall a really great person. She’s just very strong in everything that she does and she does it to very max potential so I really admire that. So shoutout Aubrey. You’re killing the game.